We speak to the founders of three iconic Malaysian brands to talk about what just makes their brand so Malaysian. Already having opened more than 20 outlets since starting in December 2013, Inside Scoop is a Malaysian ice-cream store that shows no signs of slowing down. 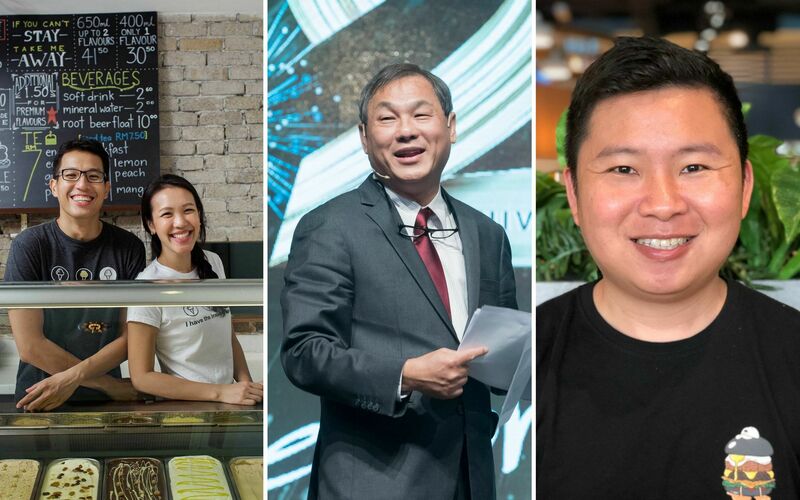 Focusing on creating honest to goodness ice creams that showcase both local flavours as well as an international portfolio, co-founders and husband and wife team Edmund Tan and Lim Shiew Li got into the business after leaving jobs in the finance industry. The reason? They just loved ice cream, they saw a gap in the market and it's a happy product. What's So Malaysian About Inside Scoop? "Our tastebuds and our staff. We're proud to say that we are one of the few F&B brands that are staffed by 98 per cent by locals. Most of our staff are part-timers that have come out fresh of university," says Tan. "It's a different vibe when you're greeted by into a cafe or restaurant and you're greeted by young part-timers that still have that energy and enthusiasm," adds Lim. "The premium ice-cream market in Malaysia was served by foreign brands and we felt that we could use local flavours and ingredients to create great ice-creams. We started with things like durian and cempedak but there's a whole lot of things that we could make like teh o ais limau, onde-onde and bandung," says Tan. What Other Local F&B Brands Or Restaurants Do You Admire? "There are a lot of brands that we look up to such as myBurgerLab, Soul Society and our friends in group of friends in business and outside of it called the Good Food Alliance," says Tan. Ask A Chef: What Is Modern Malaysian Food? Hiro Tan set up Rotiboy in Bukit Mertajam, Penang, 20 years ago, going from one neighbourhood store into an international bakery franchisor, With stores in China, Thailand, Korea, Dubai, Indonesia and Saudi Arabia, the bakery is a Malaysian success story. What’s So Malaysian About Rotiboy? "Our version of the Mexico bun is a Malaysian creation by a Malaysian baker. It is also a Malaysian Brand developed by a Malaysian that started in Penang," says Tan. Why Did You Choose To Go Into Making Bread? "I believe the most important factor in attempting to build something is why and not so much what. Having learned valuable lessons from my previous attempts, I choose the bakery business because my sister and my brother have all the relevant expertise in that area," says Tan. "Making bread and pastries is what we do but it is not only what we are. Rotiboy is in the business of making a positive difference to its team members, Malaysian community and ultimately the world through our partners and collaborators". What Are Rotiboy's Signatures And Why Do You Think It Became So Successful? "Rotiboy as a brand and company owes its current position to a single product that has brought us to where we are today, the Rotiboybun. The success of the bun is, I believe, the result of a combination of factors: Rotiboybun is an exceptional product in terms of taste, the moistness on the inside and crispyness on the outside is a combination that creates a taste match made in heaven, that it was introduced at a right time and that the initial price of RM1.20 is affordable and value for money for a product of its stature," explains Tan. "Inside Scoop, Lavender and Manhattan Fish Market," says Tan. It's tough not to know about myBurgerLab if you're a fan of burgers and live in the Klang Valley region. Started in 2012, the brand has expanded to 5 outlets and will soon be moving beyond burgers into the bubble tea and pizza area under the same "lab" moniker. Renyi Chin, one of the co-founders, reveals what is the restaurant has been getting right since it began. What's So Malaysian About myBurgerLab? "Apart from the fact that it is owned and run by Malaysians in general, although we do have international staff, we believe that we are a community brand. When I say community, I mean being able to self sustaining in the sense that we can feed the people in the area and hire the same individuals within in the area. That's where our success lies in," says Chin. "Burgers are the one true Malaysian food; all Malaysian have access to burgers in the last 25 years or so. If you haven't had McDonald's before you would have definitely have had a Ramly burger," says Chin. "To me, that is one of the reasons why we were quite confident in opening up a burger joint just simply because Malaysians love burgers," he adds. "Red Bean Bag and Strangers At 47 are just some that we admire because they have similar values to us – hiring local individuals, caring about where they source the food from and being just a good bunch of people. They're definitely Malaysian to the core," says Chin.